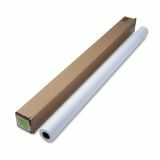 HP DesignJet Large Format Paper for Inkjet Prints, 60" x 100 ft, Coated White - Print it, mount it, laminate it on this heavyweight coated paper. Designed for low-cost, long-term laminated applications such as signs, posters and presentations, use HP Heavyweight Coated paper. This bright, matte inkjet paper which makes brilliant, colorful, medium ink-density images look crisp and smooth. 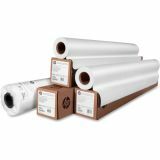 The HP Designjet printing solution-printer, ink supplies and media-is custom-engineered, tested and guaranteed to provide consistent, exceptional quality results, every time.